Run over 2 terms of 15 weeks from February – December 2019, this course gives students the full and comprehensive grounding in printmaking, from monoprint through to photo-etching, with lots more in-between. The course is tutored on Monday mornings (from 10.00am to 1.00pm), and Monday evenings (between 6.00pm & 9.00pm). 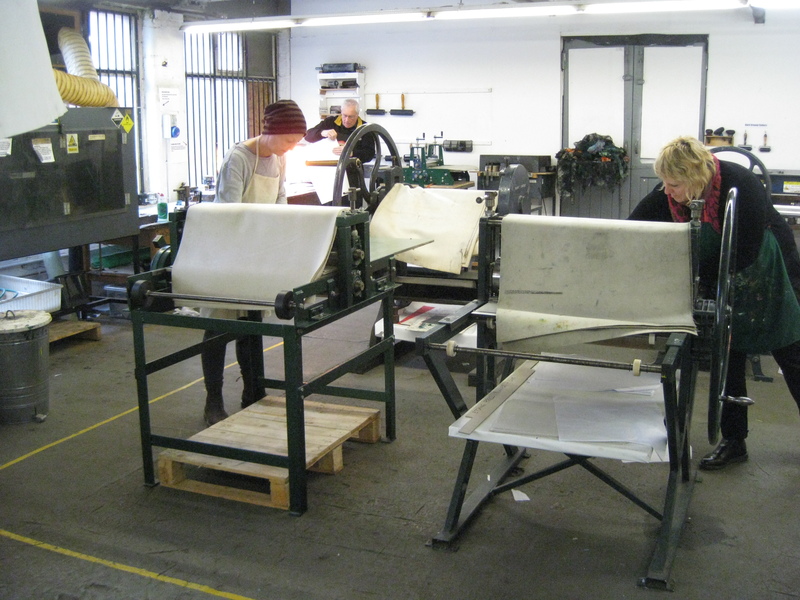 In addition to the 3 hours taught sessions all students are given a years membership of Hot Bed Press and an extra 4 hours a week to carry on what they have learnt each week. This can be ‘claimed’ in the same week or accrued to be taken in a ‘lump sum’ such as over Easter or Summer. Hot Bed Press is open throughout the year apart from national Bank Holidays and usually 2 weeks over Christmas/New Year so we are very flexible and accessible. This course reflects and responds to the increasing demand for printmaking courses that offer a deeper understanding and a greater knowledge of all the processes and methodologies available through printmaking, (in comparison to weekend courses and short-term evening courses, which offer introductions to printmaking). Students will also be given a more contextual and historical background to printmaking and be supported through development of a portfolio and focused body of work. The course is not accredited, but students will ‘graduate’ with a Hot Bed Press certificate in printmaking. The practical make-up of the course will be married up with contextual background and content driven assessment. The course offers a fuller understanding of printmaking and will be the equivalent experience to a traditional fine art first year degree in print. Jeni Nuttall teaches the sessions. Jenni has been a printmaker for many years and has taught printmaking and life drawing across the North West. Sean Rorke, [Artistic Director of Hot Bed Press] is also course leader for The Complete Printmaker. Sean has over 20 years of experience as a lecturer and module leader in printmaking. Andy is in the office during open access hours and supports the course with all administrative and operational issues. You can email him at info@hotbedpress.org or call the office to speak to him on 0161 743 3111. Outside of the 3 hours taught sessions and 4 hours self-directed study students can take up as many additional hours as they wish by purchasing an hours’ card as with any member of Hot Bed Press. Places will be booked on a first come first served basis. There is no interview or portfolio review to gain a place on the course as we expect that what students will learn on the course will bring everyone to a high level of artistic and creative achievement. The following is a broad outline of the print processes covered on a week-to-week basis. Each week will start with a demonstration followed by a practical hands-on session. More or less time may be taken up by processes/techniques throughout the course as dictated by the dynamics of the group and how each student approaches each process. 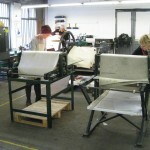 Each student may choose to concentrate on a particular method of printmaking to develop their work, but will be expected to attend each session and have a go at each technique to build a portfolio. As the course progresses more independent practice will be supported, and individual tutorials and advice sessions will be integrated into each lesson. The first term will cover monoprinting through to relief printing and etching. Tutorials, group crits and personal advice sessions on professional development will inform the progress of students and the term will culminate in a presentation to the group by each student on their work. In the second term screenprinting, waterless lithography, photo-etching and gum-arabic transfer will be taught. There will be 2 tutors for certain weeks, splitting the group in half to give more focused teaching. As the course progresses the more print techniques covered will give each student added opportunities to focus on the type of printmaking that suits their practice and style of work both in the taught sessions and in any flexible access hours. For the last few weeks with the major print methods taught students can ‘spread out’ even more into their own preferred medium. More advanced tips and advice will be given along the way. Extra demonstrations will be scheduled for more specialised methods such as editioning tips and advanced registering and layering. Each student will be supported individually to achieve their goals and improve their printmaking skills and knowledge. Comprehensive notes and instruction worksheets will be provided and critical and contextual materials on printmaking will be added and discussed. Extra reading material and other sources of inspiration will be given. The Complete Printmaker is suitable for absolute beginners through to experienced printmakers wanting to expand their skill-set and broaden their knowledge. Those with experience of one or two print practices will be supported in extending and experimenting with how they work in each medium. New and different ways of working will be encouraged. The pace of the course will be dictated by the group as a whole, and influenced by how much work each student can cover outside of taught sessions. The timetable may change slightly due to the dynamics of the group. Some techniques may require more time to allow progress and a fuller understanding, whilst some maybe covered in ‘quick time’. The taught sessions are intended to give an introductory grounding for each process in order for each student to develop their own style and to achieve their own goals. The maximum intake is 16 students. The cost is £1,200 for the full year. We ask for a £300 first payment and then from February to October we will be taking 9 monthly payments of £100 by standing order on the 15th of the month. Since starting to run the Complete Printmaker courses in 2013 we have also added a second and third year to the course. Testament to the success of the course each year to date students have asked to be able to continue into a second and even a third year. Although we do not schedule these in as definite courses or book The Complete Printmaker as a 2 or 3 year option we allow room in the calendar for 2nd and 3rd years to run. It all depends on the demand from students. We ask each group of students what they may want to do at the mid-way stage of the course, (i.e.before summer break). If the demand is there we will run a second year. The second year focuses on more personal development, tutorials, further and advanced printmaking techniques and more in depth instruction.